We’d love your help. Let us know what’s wrong with this preview of A Highland Christmas by M.C. Beaton. To ask other readers questions about A Highland Christmas, please sign up. Suggestions for any thoughtful discussion questions for my book club? There are 7 ladies...65 - 80 years old. I'm having trouble formulating interesting questions on my own...please help!! Filled with charm, laced with dark but hilarious social comedy, and sprinkled with Christmas warmth, A Highland Christmas is one of the most endearing entries in the Hamish Macbeth series. Having already firmly established with readers the tall, redheaded constable of Lochdubh with little ambition, and the quirky villagers he must contend with in the remote highlands, Beaton focuses on giving fans of the series a magical novella as a Christmas gift. Reading this is like listening to a breezy Dav Filled with charm, laced with dark but hilarious social comedy, and sprinkled with Christmas warmth, A Highland Christmas is one of the most endearing entries in the Hamish Macbeth series. Having already firmly established with readers the tall, redheaded constable of Lochdubh with little ambition, and the quirky villagers he must contend with in the remote highlands, Beaton focuses on giving fans of the series a magical novella as a Christmas gift. Reading this is like listening to a breezy Dave Koz Christmas offering on the stereo while trimming the tree. It’s dark and wintery in Lochdubh as Christmas approaches and the Calvinist element is sucking the spirit right out of the holiday for Hamish. His mother has won a soap slogan contest, and a free Christmas holiday, but Hamish can’t join his folks because he has to take over Constable McGregor’s patch in Cnothon as well as his own. McGregor has come down with a bad appendix, putting the kibosh on any Christmas plans for Hamish. And with no lights, no trees, no carols, no secular trimmings at all — except behind closed doors, so as not to get an earful from the pious — it isn’t feeling much like Christmas to our favorite Highland constable. When a Christmas tree and lights slated for the nearby village is stolen, Hamish is in no mood to be trifled with. It does seem trifling, however, when an old biddy named Mrs. Gallager reports her cat missing and insists Hamish find it. Intuitive as ever, Hamish senses there’s more to her being frightened than she’s telling. He also senses she’s lonely. When a young schoolgirl named Morag, with parents so dogmatic she hasn’t any friends, may be the culprit in one of the cases, what’s Hamish to do but put two lonely people together for a very special Christmas. +1 SNAPPY DIALOG: “What’s up with you, Constable? Standing about like a great loon. Shouldn’t you be about your duties?” I got a kick out of how all the locals take it upon themselves to bully Hamish, almost like it’s their civic duty. I believe this is healthy behavior. In fact I plan to adopt it in all my future dealings with the police. -1 HUMBUG: To the question "What will you be doing for Christmas?" the response "Sitting getting drunk & trying not to put my foot through the telly. Do you know they're showing The Sound of Music again? It's enough to drive a man mad” Almost changed this to a plus. +1 NO PLOT: (view spoiler)[Someone pinched Mrs. Gallagher’s cat. Oh, and a string of lights, and a tree. That's it..."Probably the Free Presbyterian’s, so uptight they believe if they don’t keep the blankets tight over their feet at night the pope will sneak down the chimney & bites their toes” (hide spoiler)] Sometimes my brain needs a rest, I need a book about nothing. +1 CULTURAL REFERENCE: great recipe included for cloutie dumpling – throw ingredients into a large pillowcase along with suet & boil. Helpful if you have a washhouse (I know, I know) with a large copper basin (to boil the cloutie in) Slice & fry up with bacon - lasts for weeks. +1 ½ AMBIANCE: “A ragged cloud of crows rose up from the field and scattered over the loch. On such a day it seemed the grass would never grow again or the sun shine.” I find this appealing. +1 CHARACTERIZATION: Ah, the main protagonist, the dour and downtrodden local constable Hamish Macbeth. I think I’m in love. -1/2 VALUE: 160 pages? Maybe the author is charging by the word. This was Just the sort of Christmas mystery shorter work I was looking for. I read the first of the Hamish Macbeth mysteries not long ago. Normally I would not jump this far into a series, glad I did. Missing cat and a stolen town Christmas tree and it's lights make up the crimes being investigated. Hamish who seems to have his heart in the right place mist of the time helps spread Christmas cheer and along the way solves the crimes. Hope the characters Hamish helps out make appearances in the se This was Just the sort of Christmas mystery shorter work I was looking for. I read the first of the Hamish Macbeth mysteries not long ago. Normally I would not jump this far into a series, glad I did. Missing cat and a stolen town Christmas tree and it's lights make up the crimes being investigated. I know Christmas is over but it didn't stop me relishing in the festive feel of Lochdubh (or rather, the lack of it!). Hamish is roused from his relaxing break to search for a missing cat, missing Christmas lights and a missing Christmas tree - does someone have a grudge against Christmas? It's always a joy returning to Hamish Macbeth's side, and we are introduced in this story to one of his very favourite characters which I was over the moon about! So darling! Not a murder, but just a cute, cute Christmas story with our favorite Highland detective. Of course, there is a mystery here: who has stolen the Cnothan city Christmas lights? And there's the matter of a missing cat, a bitter old biddy, and a flirtatious new schoolteacher. Reread, 2012: Love it when Hamish loses his temper with the Andersons! So great! Reread, 2013: Such a fun way to kick off the Christmas reading! Reread, 2014: Never fails to put me in the Christmas mood! Reread 2015: E So darling! Not a murder, but just a cute, cute Christmas story with our favorite Highland detective. Of course, there is a mystery here: who has stolen the Cnothan city Christmas lights? And there's the matter of a missing cat, a bitter old biddy, and a flirtatious new schoolteacher. Reread 2015: Even though I'm not reading all my Christmas books this year, I had to read this one! Christmas lights are being stolen and cats are going missing. Christmas in Lochdubh is fighting bitter gray winter cold and parents who don't believe in Santa. Can police officer Hamish Macbeth make it all come out right? And what about the pretty new schoolteacher? Can she make Hamish forget about his old flame Priscilla? It's one of the lightest in the series but a perfect holiday treat. 4.5*s. Superb! Funny, witty and charming. 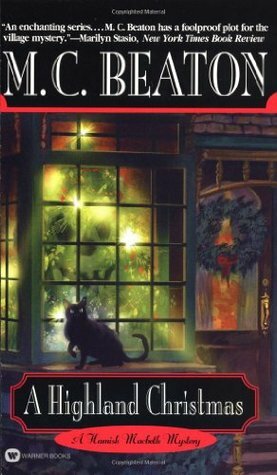 A Christmas novella that has Hamish Macbeth solving mysteries of a missing cat and stolen lights. He brings Christmas cheer to some residents in the area. Some local people do not want Christmas celebrated with lights and gifts. Hope several of the people introduced in this book will be in future books. It was a feel good read and Hamish shows himself to be special to the people who are in his policing district. Plus there was a new addition to his household. A bit of charming, mildly mysterious fluff in the Scottish Highlands. I confess to never having read M.C. Beaton before but this was a lovely way to start. With thirty plus novels about the unlucky in love, dashing, much put upon detective Hamish Macbeth, under her belt Ms. Beaton has certainly been doing something right! Not as long as Beaton's usually fare this was nonetheless a nice way to meet Hamish who's clearly kind, very capable at his job, and perhaps just a touch too moronic when it co A bit of charming, mildly mysterious fluff in the Scottish Highlands. I confess to never having read M.C. Beaton before but this was a lovely way to start. With thirty plus novels about the unlucky in love, dashing, much put upon detective Hamish Macbeth, under her belt Ms. Beaton has certainly been doing something right! Its Christmas time in the Scottish Highlands & Hamish Macbeth is all about making sure everyone enjoys this time of year in this Christmas instalment of The Hamish Macbeth series. Lovely very light Cosy mystery, with a missing cat, stolen Christmas lights & a new school teacher who takes a bit of a shine to our Hamish. I really like Hamish & really must get around to reading more of this series. Nice, easy read with all of your favorite characters. Hamish is investigating a theft this go round instead of a murder but it was the perfect Christmas in the Loch with Hamish at the helm ensuring his small town has the perfect holiday. A great introduction to this author's writing. Enjoyed the well described atmospheric Scottish Highland settings. Familiarity with locations mentioned added to my enjoyment and the reality of the story. Definitely could picture the Christmas attitudes resisting celebration due to religious heritage and loved the actions of our protagonist in bringing that feared celebration into so many lives. A fun, quick reading addition to my Christmas shelf ! Graeme Malcolm was a fine narrator for the audiobook. The Scottish accent heightened the experience. This really is cosy crime, with nothing more threatening than a lost cat and some nicked christmas lights and a tree. The hero, PC MacBeth, has more to worry about from his unreasonable and nasty boss than any criminals, apart from one near mishap when apparently his spectral dog comes to the rescue. Having dropped into this, not realising it was so late in the series and just a novella, I found it rather light though it was easy enough to pick up on the situation - the PC unlucky in love and st This really is cosy crime, with nothing more threatening than a lost cat and some nicked christmas lights and a tree. The hero, PC MacBeth, has more to worry about from his unreasonable and nasty boss than any criminals, apart from one near mishap when apparently his spectral dog comes to the rescue. Having dropped into this, not realising it was so late in the series and just a novella, I found it rather light though it was easy enough to pick up on the situation - the PC unlucky in love and stuck on duty over Christmas in a community where the Calvinist spirit lingers and it is considered unseemly to celebrate in what is viewed a pagan manner. He manages to do some good on that front, helping both a little girl and a frightened and isolated old lady. Now this was a cozy Christmas mystery. Loved it! I will add it to my personal Christmas advent reads list now. So, I’ve had A Highland Christmas on my shelf for a while now and decided to crack it open during the Ho-Ho-Ho Read-a-thon. Here’s what’s going on: As Lochdubh and the surrounding Highland villages are mostly made up of Calvinist, Christmas, much to Hamish’s disappointment, is off-limits as it’s still thought of as a pagan holiday. When Cnothan decides to put up a Christmas tree and fairy lights, the town’s in an uproar when they discover that they have been stolen, thus Hamish is sent out to in So, I’ve had A Highland Christmas on my shelf for a while now and decided to crack it open during the Ho-Ho-Ho Read-a-thon. Here’s what’s going on: As Lochdubh and the surrounding Highland villages are mostly made up of Calvinist, Christmas, much to Hamish’s disappointment, is off-limits as it’s still thought of as a pagan holiday. When Cnothan decides to put up a Christmas tree and fairy lights, the town’s in an uproar when they discover that they have been stolen, thus Hamish is sent out to investigate. Although he has his hands full when Mrs. Gallagher, a crabby old lady who lives alone, reports her cat has gone missing and Hamish takes it upon himself to get to the root of Mrs. Gallagher’s problems. As his investigation goes forth, Hamish finds himself—with the help of the new teacher—spreading a little Christmas cheer to a lonely little girl. I’ve been a massive fan of M.C. Beaton’s Hamish Macbeth Mysteries for years and I have to say that this one was such a delight a lovely little edition to the series. While the series is a cozy mystery series, this one is a lot lighter than the others. There’s no death, destruction, or mayhem just a missing cat, a crotchety old lady, a lonely little girl who was never allowed to celebrate Christmas, a nicked Christmas tree, and some stolen fairy lights. Oh, and a new schoolteacher that’s taken a shine to Hamish. And to make things a tad more interesting, Priscilla—Hamish’s on-again-off-again girlfriend who I would love to see take a long walk off a short pier—decides to reenter his life. If you’re a fan of the Hamish Macbeth Mysteries, you will delight in visiting Lochdubh again. If you’re new to the series, you will get a lovely glimpse of a little Highland village filled with unique and memorable residents. One thing that I love about this series is that Beaton truly beings in the Scottish Highlands to life. The dialect, the scenery, and the characters are true gems of the Highlands. So, this is book 16 in the series but, fear not, this book works brilliantly as a standalone. Although do be warned, if you’re expecting the Hamish Macbeth from the telly show, book-Hamish is a tad bit different but just as lovable. Overall, this was heartwarming edition to this series and I’m so glad that I finally had a chance to read it. It’s a novella, so it a bit shorter than the others in the series, but it’s well-rounded and doesn’t leave you wanting more. If you’re looking for a unique Christmas read, give this one a go. Cozy, fun. Sometimes it's nice to have a very gentle book in which nothing much happens, but what does is nice. This is one of those. The series of Hamish MacBeth (a show I never watched when it came on 20 years ago. Even now I may be at the young end of the demographic) isn't one I've ever read, and after this short, warm/fuzzy book I'd do so again. It's hardly dark or gritty - someone's cat has gone missing, and some Christmas lights have been stolen. There's still time for a few good digs at Cozy, fun. Sometimes it's nice to have a very gentle book in which nothing much happens, but what does is nice. This is one of those. The series of Hamish MacBeth (a show I never watched when it came on 20 years ago. Even now I may be at the young end of the demographic) isn't one I've ever read, and after this short, warm/fuzzy book I'd do so again. It's hardly dark or gritty - someone's cat has gone missing, and some Christmas lights have been stolen. There's still time for a few good digs at the Calvinists disapproving of everything, including fun, and there's always the undercurrent of the religious bigotry that's steadfastly refusing to die off. But this is feelgood stuff, and I'll take a bit of schmaltz at this time of year. 5 years later, lol. I recognized this story but kept reading it because I liked all of the Christmas details. this time around I thought it was a sweet story. still simple and very un-demanding, which can be just right when you need it. The story is simple and undemanding, the characters aren't particularly complex, and everything gets wrapped up neatly. It's a little bit too cute for me, but it's a good light read for Christmas; lots of Grinchy hearts grow three sizes etc. I love Hamish McBeth. This Christmas tale has him solving mysteries and turning miserable people into happy ones. A winner. Want a really feel good read for this holiday season? Get a copy of “A Highland Christmas”. Take a break from murder and mayhem and allow M.C. Beaton to get you into the Christmas spirit with this holiday story. Perfect little book for Christmas! No murders or violence. Just minor mysteries with happy outcomes. I like the Hamish Macbeth TV series and when I saw this book, I had to get it! A Highland Christmas is now on my list of FAVORITE and WONDERFUL Christmas novels! A nice light little read that I quite enjoyed. I love MC Beaton I just gobble up her books.